Oh, no! 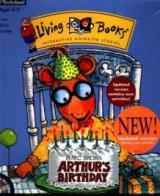 Arthur has the very same birthday as his friend Muffy. All of the boys decide to go to Arthur's party, and the girls settle on going to Muffy's. Now, it's up to Arthur and Francine to unite the two groups for one big birthday celebration! Of course, this is going to take cooperation, listening, and compromise. Kids can strengthen their reading, music, vocabulary, and social skills with this series of challenges from author Marc Brown. Two different educational games come on the CD-Rom, and gameplay is recommended for children between the ages of three and seven. In 1997, a 2.0 version was released which included updated graphics and Windows 95 support.